Silas Melson didn't hit double figures in Portland, but he had some huge plays in the Thanksgiving weekend tourney. It might not be as timeless as entering a tryptophan-induced coma or trying to avoid political conversations with your extended family, but watching Gonzaga win games has become a bona fide Turkey Day tradition. Mark Few has led the Bulldogs to 33 wins, and just nine defeats, in tournaments taking place over Thanksgiving week. 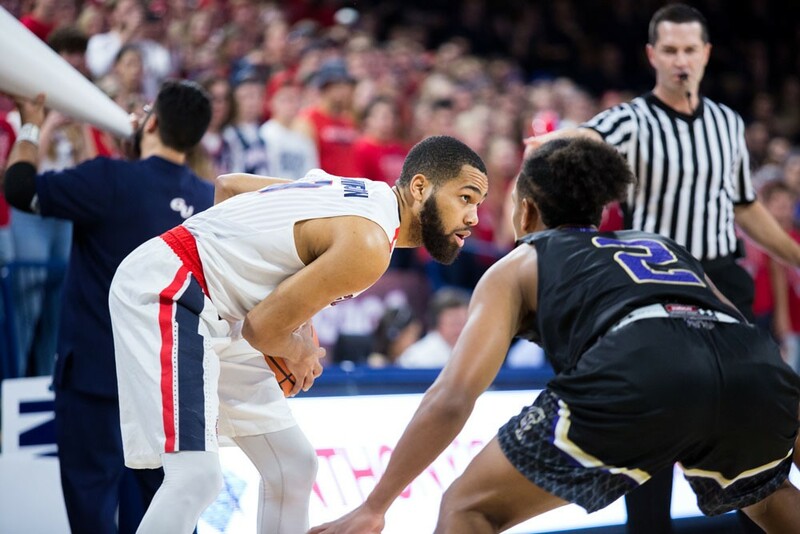 Every step of the way on the program’s climb from Cinderella darling to championship contender, Gonzaga has made great use of these early-season tournaments. In Few’s first seasons, when Gonzaga was still seen as a fluke rather than an elite national program, these tournaments served as rare opportunities to compete against the teams Gonzaga aspired to be. As Gonzaga developed into a perennial NCAA Tournament participant the Zags went from hunter to hunted in events like the Maui Invitational and Orlando Classic. Over the past few seasons, as Gonzaga’s level of success began to rival any program in the country, their performance around Thanksgiving became equally impressive. Gonzaga won three Thanksgiving tournaments between 2012 and 2016. But none of those tournament fields could hold a candle to the one they’d face in 2017. So here was Gonzaga, as good of a program as exists in college basketball, firmly middle of the pack in the biggest, best early season tournament field in the sport’s history. Ohio State, which fell to Gonzaga 86-59 in the opening round, boasts an endowment of over $3.5 billion. Texas, which fell 76-71, spent over $171 million on athletics in 2016, according to USA Today. And Florida, which needed two overtimes to defeat Gonzaga, is ranked No. 6 in the polls and very nearly upset top-ranked Duke on Sunday. Gonzaga was not only asked to take part in the greatest event of its kind, Gonzaga excelled in it. On Thursday it was Josh Perkins, who hit six of nine three pointers and electrified the crowd with amazing efficiency. On Friday, a career-high 39 points in a warrior-like performance from Johnathan Williams led the way for the Bulldogs. And Sunday, with 20 points and nine rebounds off the bench, was a coming out party for Rui Hachimura. There may not end up being anyone like Kelly Olynyk, Adam Morrison or Dan Dickau on this team; there’s no name that will resonate across the country even outside of basketball circles. But every name in Gonzaga’s rotation, to a greater degree than maybe ever before, seems likely to be well known within those circles. Over six games to start the season Gonzaga has had five leading scorers. Corey Kispert and Silas Melson, the two players with the most minutes played who have yet to lead the team in scoring, both had big moments over the weekend. Melson, a senior, hit timely shots late against Florida and Texas. And Kispert drew regular praise from ESPN’s commentators for being a freshman who looks very much like a veteran. Which means when he finally is a veteran, those same commentators will be annoying us with quips about how it feels like Kispert has been at Gonzaga for ages, rather than just four years. Yeah, Gonzaga entered the season ranked in the preseason AP Poll. Nobody thought the Zags would be bad. But coming off the greatest year in program history, and losing four key players from that team, it was safe to assume Gonzaga would take a sizable step back in 2017-18. Even arch-rival Saint Mary’s, the unanimous first place team in the West Coast Conference’s preseason coaches poll, and a pair of Pac-12 teams, Arizona and USC, were ranked higher than Gonzaga coming into the season. Well, Saint Mary’s dropped back-to-back games over Thanksgiving. And no offense to the folks down in Pullman, but a team that is supposed to dethrone Gonzaga has no business losing to Washington State. Arizona, which was ranked No. 2 in the AP Poll, lost three straight games last week and fell all the way out of the Top 25. And on Sunday USC got clobbered by Texas A&M, 75-59. After the Thanksgiving action, Gonzaga sits at No. 15 in the AP Top 25, and No. 14 in the USA Today Coaches Poll. We learned a long time ago that if Mark Few is coaching at Gonzaga, the Bulldogs are a safe bet to do well around Thanksgiving. He showed us this weekend that his squad is also a safe bet to be best in the West yet again.